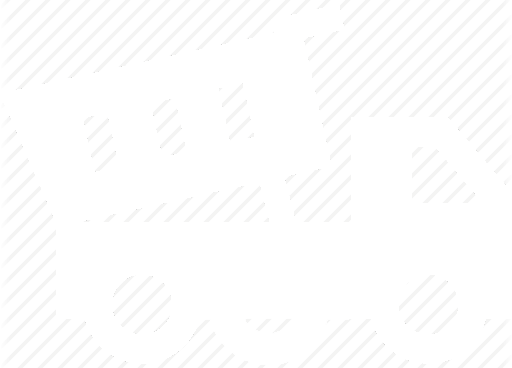 The ever increasing pressure on countryside managers to remove potentially dangerous dead trees is one of the reasons for the decline in available standing dead wood. 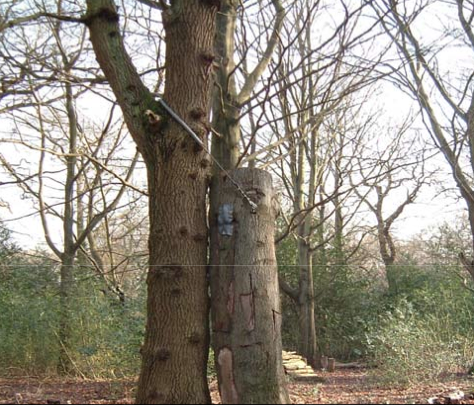 This particular type of habitat forms an essential part of the woodland ecosystem providing wildlife such as woodpeckers a ready supply of soft drillable wood in which to form nest holes , these disused nest holes then provide a whole range of other fauna a safe place to shelter including species such as bats and other nesting birds. Standing dead wood decays slower, lasting for longer than timber stacked on the ground. 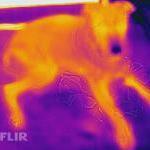 The dryer conditions are also favoured by different fungi and specialist invertebrates. Finding a safe and sustainable way to retain such standing dead wood in the landscape is the challenge that now faces countryside managers. 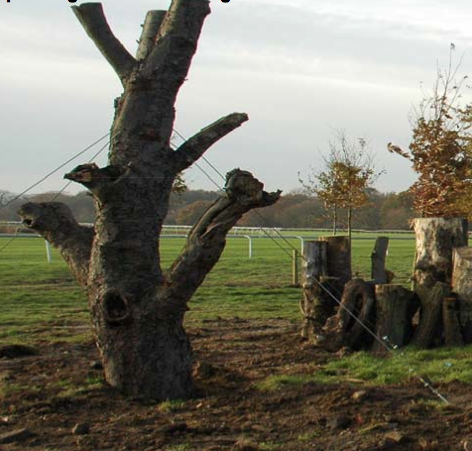 Dead trees can be made safe by careful reduction work as an alternative to felling. 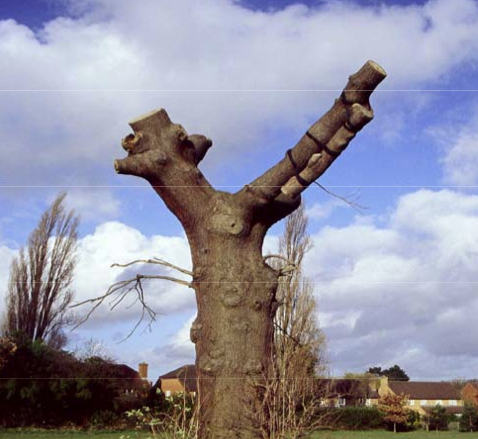 As gardeners, park managers, foresters and arborists we are in some way possessed at maintaining a perfect environment where we strive to remove deadwood, fallen leaves, stumps and anything that we might think could pose a risk or may look unsightly. This attitude to the green areas around us has been around for many hundreds of years having first started with the great gardens of Britain where dead trees were removed leaves gathered up and grass kept impeccably mown, this idea has now manifested itself in the way we manage our small urban gardens, with a greater enfaces being placed on those all too important words Health & Safety. This apparently well maintained and safe environment that we have created for ourselves has with out doubt drastically affected the flora and fauna that relies so heavily on the very things we deem to be unsightly or unsafe. 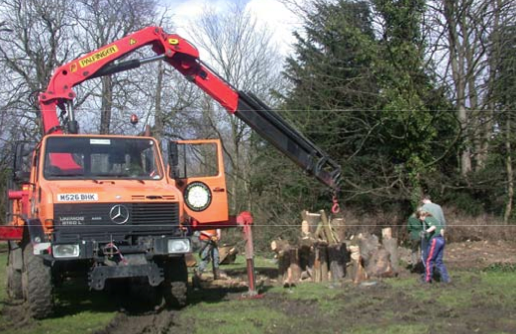 We utilise a unimog mounted crane to assist with lifting the larger logs into place which allows each log to be held in place until it can be made secure. 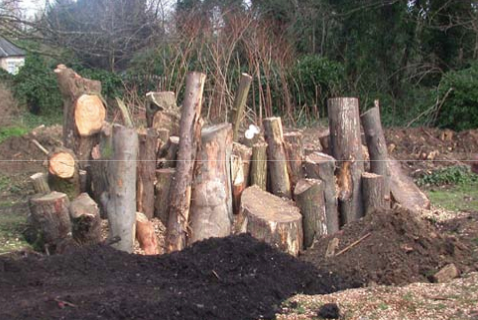 In an attempt to turn back time there are many things that we can do to boost an areas bio-diversity, at ArborEcology we are now offering a service to install both vertical and horizontal log piles to cater for stag beetles aswell as a whole host of other species which will take advantage of the shelter and food source associated with these habitat improvements. These stag beetle piles formed part of the mitigation measures for the loss in habitat created by a nearby development. 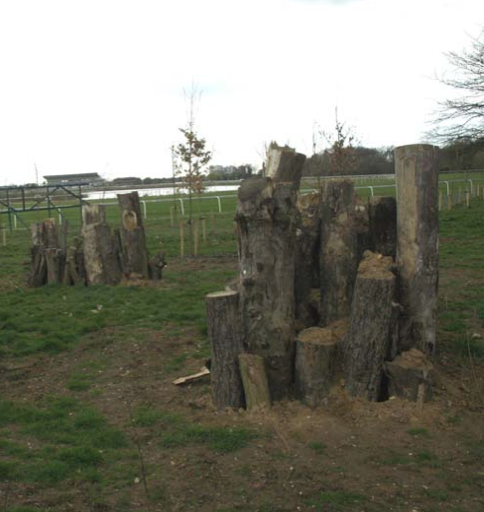 This style of habitat replacement is designed to mimic the habitat provided by dead tree stumps and is specifically aimed at providing a habitat for stag beetles although other wildlife will become associated with it in time.